Gear up and join the fray! We’re dropping a weapons crate in Battlefield 1, filled with nine new guns and two lethal melee weapons*. Whether you’re new to the fight or an old veteran, all but two of these weapons are immediately available in your arsenal. The coveted Annihilator Trench and Sickle melee weapon will need their Weapon Assignments completed to earn the right to bring them into battle. Brand new weapons are just one part of this update. We’re also bringing a new feature that will better communicate when a Scout is in the most optimal range while aiming down scope, along with more ranks, unlocks, and fixes to Battlefield 1. We hope you enjoy the update. 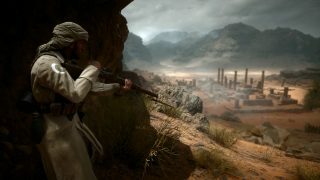 *Battlefield 1 Weapons Crate Update is a required update for all Battlefield 1 players. Eleven new weapons are dropping in this update. Undoubtedly the prize of the pack is the Annihilator Trench. Anything outside the shooter's sweet spot will appear out of focus (i.e. blurry). Anything inside the shooter's sweet spot will be in focus (i.e. clear). Opponents inside a sniper's sweet spot will see a rainbow lens flare. The following table outlines each rifle’s sweet spot distance and the type of glint opponents will see. Reduced undergrowth flicker in River Somme and Caporetto. Fixed an improperly configured forward tank spawn on Amiens in Conquest. There should now be two tanks consistently for both teams, one of which can utilize forward spawning. Increased the damage of stationary AA guns in the single player War Stories, improving the chances for players to earn the “Airborne Cannons” codex entry. Fixed an issue where the hatches of the C-Class Airship would sometimes fail to animate properly when a player rapidly switched positions in the vehicle. Added new Weapon Assignments for the Annihilator Trench and Sickle melee weapon. Fixed an issue where players could skip earning class rank dog tags when levelling up more than 1 rank at a time. Players who experienced this issue will receive their missing dog tags the next time they level up.